This fall, I spent a week on Emory’s main campus located a few miles from downtown Atlanta in the Druid Hills neighborhood. The first stop was the World of Coca-Cola where I was able to learn about the history of coke and explore the story behind one of the world’s most popular beverage brands. You can even visit the vault where the legendary secret formula of Coca-Cola is kept. It was a bit gimmicky just to see the metal vault door of the recipe. They hype it up like you are actually going to see something… but of course not! Although I don’t really drink sugary soft drinks (I know… crazy! ), the best part was at the end where you can taste some of the various types of Coca-Cola branded products from around the world. From Fanta Melon Frosty (Thailand), to Vegibeta (Japan), to Bibo Candy Pine-Nut (South Africa) – it was a treat for your taste buds (not your teeth). Next was the aquarium, which is just steps away from the World of Coca-Cola. It is one of the largest aquariums in the world! It is split into seven galleries and exhibits: Tropical Diver, Ocean Voyager, Cold Water Quest, River Scout, Dolphin Celebration, Pier 225, and Aquanaut Adventure. This is definitely one of the best aquariums I have visited. It is wonderfully laid out and each section is a unique gallery to showcase the fish and wildlife of that area. I highly recommend visiting it. If you are in a rush, the best exhibit in my opinion is the Ocean Voyager – it contains a tank with 6.3 million gallons of salt water and thousands of fish. There is underwater tunnel (one of the world’s largest) to view the fish and reef system. I also quickly visited the Center for Civil and Human Rights, which is dedicated to the achievements of the civil rights movement in the US and worldwide. There are several permanent exhibits including an exhibit with the personal effects that belonged to Dr. Martin Luther King Jr. The center definitely left me thinking how far we have come but how much more we still have to do! The building itself is also very unique. Right by Centennial Park, there is a giant Ferris wheel, with 42 climate-controlled gondolas climbing 20 stories into the air, which provides an amazing view of the city. It was fun to see everything from a bird’s eye view but the lines can be quite long and slow moving. The views around sunset/evening are the best. Right by the Ferris wheel is the CNN building where you can take a tour of the studio. The tour gives you an up-close look at CNN and how global news works. It is a working studio so we were not allowed to take pictures. The tour itself is a bit of a letdown because everything was very brief with very high-level introductions. For the most part, you can only see into the studio from afar with no real behind the scenes access to anything unique. The last stop was the Martin Luther King Jr. National Historic Site, which is managed by the National Park Service. 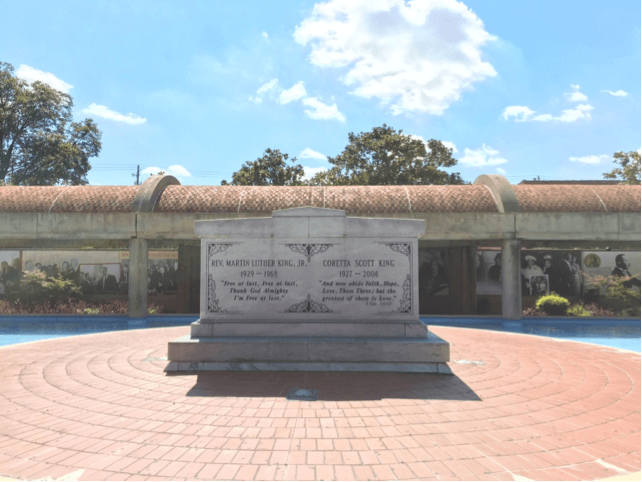 It includes 3 main sites: the home where Martin Luther King Jr. was born, the church where he preached, and the memorial site where he is buried. It was a great way to spend the afternoon. Very humbling. It was a perfect way to learn more about American history and Martin Luther King Jr.’s work in the context of the time period he grew up in. It was a bit depressing at times, but again, it really makes you think about the things that are going on today and helps you understand the struggles of African Americans. So, this wraps my whirlwind trip to Atlanta – I hope you have time to check these out if you are ever in the city. Let me know what is your favourite!